← Nothing happens for a Reason. The hit Netflix series, “13 Reasons Why” tells the story of a girl named Hannah that kills herself. She leaves behind 13 recordings that name 13 people from her high school as contributing factors. Each person must listen to all 13 tapes as they follow a treasure-hunt style map Hannah left for them, so they can gaze upon the scenes of the different crimes as the now dead Hannah talks them through it over a headset. If they don’t listen to all the tapes, and pass them to the next of the 13 perpetrators, a second set of copies will be released to the world, and everyone will know their secret shame. Sounds tantalizing, doesn’t it? What a modern-retro way to kill yourself: shame and torture your enemies old-school-style with mix tapes, so they have to wander around with a Walkman and wait until your scathing wit and sarcasm devestate them into a state of self-enlightenment. Except, in the real world, that’s not quite how it happens–does it? Suicidal kids don’t generally hatch elaborate, post-mortem schemes that bring the universe and everyone in it back into an uneasy, (albeit painful) alignment. Those things only play out in bad, Nicholas-Cage-Apocalypse movies, or Netflix series that target the lucrative teen market, apparently. In theory, it sounds good: gripping subject (teen suicide) + popular style of film that teenagers like (The Butterfly Effect) should equal=both a hit show and something parents can feel good about their kids consuming –like sugary cereal with pink marshmallows, naturally colored from beets. Although “13 Reasons Why” definitely is a hit, perhaps we shouldn’t feel so good after watching it–because there is nothing romantic or poetic about kids that kill themselves. Kids that take their own lives don’t drift off in bathtubs after slitting their wrists while their antogonists painfully give birth to truth and meaning in a parallel f-ed up universe. Teens that commit suicide hang themselves in closets, or down a bottle of OxyContin from Mom’s medicine chest. There is nothing artistically poignant about a parent cutting down the dead, bloated body of their child, or finding their baby lying stiff somewhere after overdosing, covered in dried vomit and diarrhea–without ever knowing why. For real people left behind, it’s often over before it ever began. There isn’t any gentle rising action or symbolism to cue that something’s wrong, no palpable climax of tension that could be interrupted and de-escalated, no neat, tidy resolutions. There aren’t even any warnings, just a subtle feeling here and there that leaves as quickly as it comes, like indigestion. Am I coming down with something serious or was it just something I ate? In the aftermath of real-life suicides, there aren’t any Hannah Baker recorded answers from beyond the grave, no hidden meanings played out to somber indie soundtracks, no credits rolling across a black screen to signal it’s over. Simply put, when somebody kills themself– they were there and then they were not. Whoever’s left behind–cut off–like a rope snapping in two. There’s no biting, social commentaries left on a series of cassette tapes that will change the cultural climate of high school forever as we know it. Even if a suicidal teen did become inspired to leave their own “13 Reasons Why” for their tormentors, it would probably be thrown out the school-bus window like a candy-bar wrapper five minutes after it was discovered. But that doesn’t make good television; does it? Suicide in kids isn’t an elegant, thoughtful, discourse on high school culture that can be edited down into 13 episodes on 13 cassette tapes. It’s a desperate, singular act of despair–a permanent solution to a temporary problem. But the tragedy is, kids don’t realize their problems are temporary; that a whole, new world lies beyond high school with fresh new characters and themes. They believe they are marooned on an island, trapped in “Lord of the Flies” where adults only idle around the perimeters of their days, like search and rescue vessels–sailing past smoke-signals drifting up from inside locker rooms, corners of classrooms, backseats of school buses, and even from the windows of their own kid’s bedrooms–long after the school day is done. No matter how artsy and stylized we present it, we cannot gift tortured teenagers our adult hindsight. We can’t make them see life after school, that the reign of savage boys ends once they get off the island. The neural pathways in the teenage, human brain aren’t even fully connected until somewhere in their mid-twenties. So, why are we demanding insight from beings unable to truly understand the effects of their own behavior on other people for at least another decade? They aren’t capable of seeing life past the shores they are standing on. And if they can’t escape, they’d rather jump in and drown then end up like Piggy with his head caved in. Words are stones, and kids never get tired of throwing them at each other. As adults, the nerve cells in our brains fire smoothly through their fully-formed, fatty, myelin sheaths. We can see our 13-year-old bully ghosts that tormented us plainly against the backdrop of adult shame we still carry over fat girls and awkward boys with thick glasses–greasy-haired loners we wish we could find on Social Media. Not to humiliate, like we did alongside our classmates ages ago left to our own primal impulses in the wasteland of middle school. But to apologize. To beg forgiveness–because we recognize the animals we were then and the time and travel it took to become the humans we are now. We can’t stop bullying and teen suicide by appealing to the feral minds of beast-boys. We can’t force savages to drop their stones and stare at distant shores on hazy horizons, insisting they see the valleys and ridges it took our whole lives to appreciate the nuances of. We can’t keep our kids safe sitting off-shore in our rowboats. And we can’t count on the search and rescue ships circling in shallow waters–that teachers and school staff will recognize smoke signals before we do. Even we, as parents, often miss the fire for the smoke. The answer must be–do whatever the hell you have to do in order to get your kid off the dam island: quit your job, sell your house, move to another school district, send them to live with a relative, downsize, homeschool. And before you start listing all the reasons why you can’t, first pretend it’s too late. Pretend they are already gone, without warning, like a rope snapped out of your hands. Then see if those reasons why still make any sense. A week after I published this, the copycats started. See picture below. 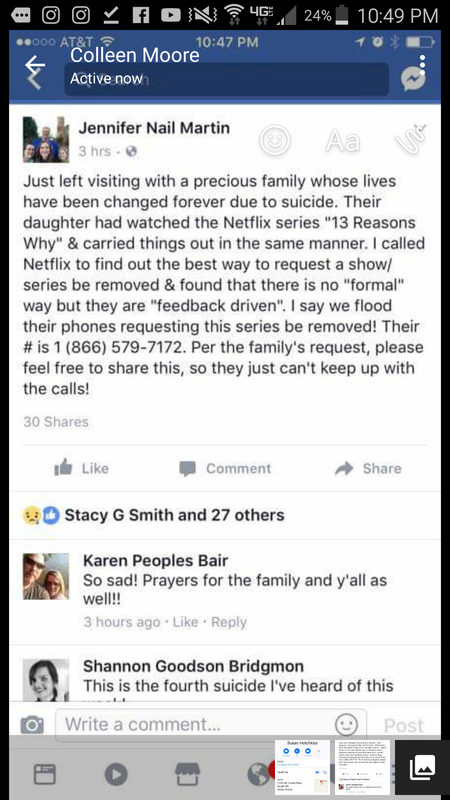 Image | This entry was posted in Parenting and tagged 13 reasons why, Lord of the Flies, Parenting, teen suicide. Bookmark the permalink. Thanks Andrea. I still remember your short story “The Chair” which was pretty awesome. You have the same gift! Hilarious. I have no recollection of that story. There was some of thst. It wasn’t a badly written show. I just think good art must be truthful and it wasn’t. It was very artful but not in an honest way when it came to the tapes and all that. I think the bullying was presented well and the effect on her, but the rest was definitely glorified and glamorized. Thanks for reading and your thoughtful input. It is much appreciated. I hate that. It’s a shame, really. Our media can have such a profound impact that it saddens me to see it wielded irresponsibly or carelessly. I completely agree. Suicide is final, there are no lessons that can be taught from the grave, and it is not an acceptable response to bullying. I haven’t watched this show, but it does sound as if it give the wrong message, as if suicide somehow teaches those who are being cruel the errors of their ways. As you say, they are not mature enough to be taught that, and all that happens is that an innocent life is lost, forever. I know far too many people who have lost a loved one to suicide to have any patience for a show or story that glamorizes it. Thanks for this post. Thanks for your thoughtful response, Ann. I read about an 8-year-old that hung themself this past week. I can’t even imagine. This was a popular book with my high school students a few years back. Someone in the English/Language Arts supervisory department at central office actually provided a few copies of this title for my classroom library. Not sure of the wisdom there–yes, it’s important to put books into kids’ hands that they want to read, but I’ve witnessed the impact of teen suicide on school communities over the course of my career and it’s sobering. Teens think life is like a video game and that there are do-overs. As we adults know, there aren’t. Thanks for tackling a tough subject! Thanks for taking the time to read and reply with such thoughtfulness. You are so right about thinking there are do-overs.